I finished the summer work ( just before my vacation ), by working on a campaign for Ogilvy in London, and chasing around a deserted power station in South London. After many attempts and a few quid slipped to the the site manager I was given access, and this let me get the backgrounds for my latest Lurzers Archive insert. 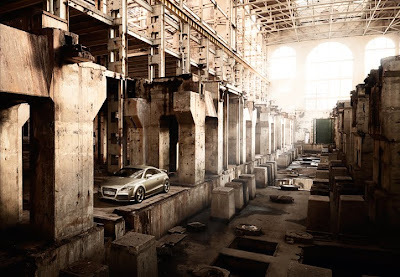 It was pretty amazing, the light was fantastic, and the structure of the old turbine hall created a post apocalyptic scenario, which I decided would hold a nice shiney audi TT 2010. The team at This Little Fish did (as usual) a fantastic job on post - thanks to Scott and Mikey for that. I hope you like it. I've just returned this past weekend from my vacation in Italy and took some time out to take some images, and I'll do a separate blog for those when I have the images ready. Its also looking like its going to be a busy end to the summer, I've got shoots coming up in Scotland and New York, and I'll write a blog for those when they happen. looks great, what an amazing location, wish i could have been there!